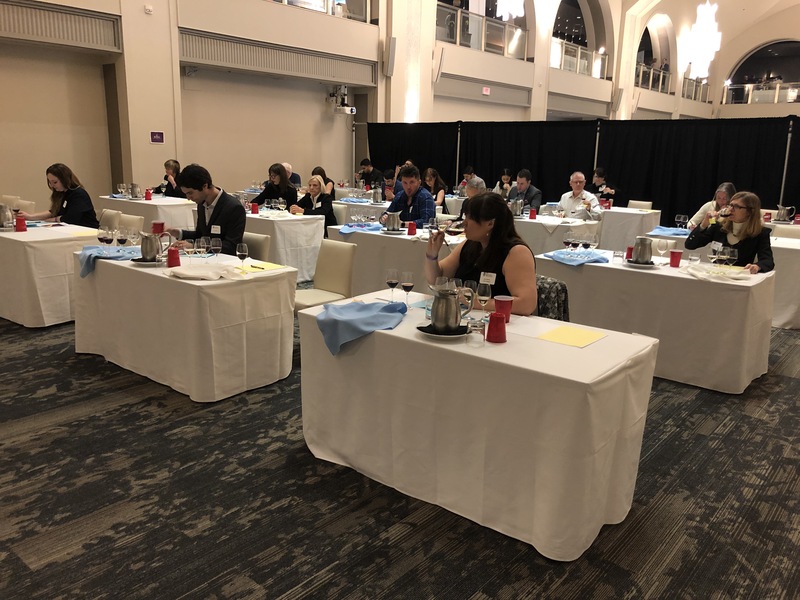 Sommeliers, wine agents and enthusiasts were drawn from all corners of Ontario and beyond this past weekend (April 14th, 2019) for the Best Ontario Sommelier Competition. 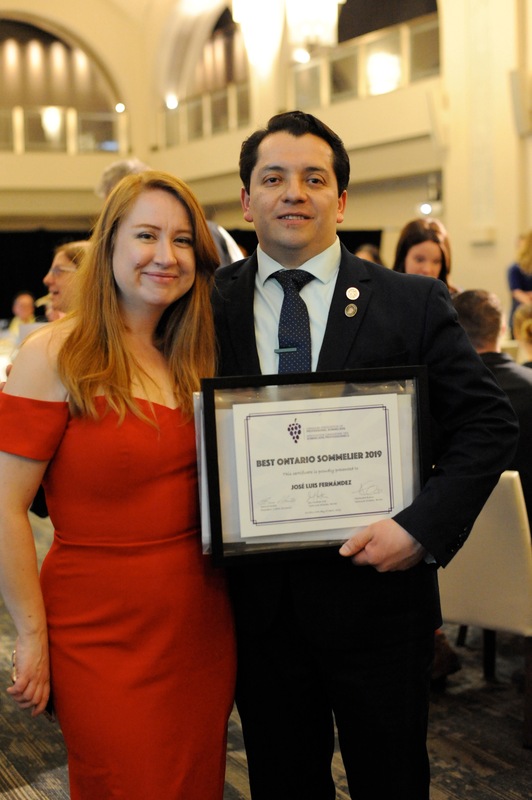 This biennial event organized by the Canadian Association of Professional Sommelier’s Ontario Chapter (CAPS) drew record numbers to view five sommelier finalists compete live for this coveted title. If you wonder what that entails, this Olympic style challenge throws restaurant inspired curveballs at sommeliers to test their skills in a high-pressure environment. With an audience on the edge of their seats, a collective sigh of relief was unilaterally uttered by the otherwise silent crowd after each of the five, 30-minute sommelier challenges were complete. The order was randomly chosen as the competitors remained sequestered in chambers on the mezzanine above the Arcadian Court’s grand ballroom. One at a time, they were ushered down to face a unique and unknown set of challenges. Jules Garton, of Four Seasons’ Café Boulud was first to be called and later was awarded 1st runner up in the competition. Following a dialogue initiated by Toronto’s very own “Wine Witches” requiring Garton to show off her knowledge of pet-nat, a notable trend in wine bars in Canada and across the globe, she was interrupted by a late wine delivery by Toronto agent Nicholas Pearce in the middle of service. “Knock, knock, knock, knock, knock”, Garton was swift with the reply: “Nick, always late for the delivery!” breaking the tension in the room with a laugh from the crowd. After deliberation by esteemed judges: Christina Sharpe, Head Sommelier of Barberian’s Restaurant, Elyse Lambert MS, former Canadian Sommelier Champion, and WineAlign’s own John Szabo MS, the winners were announced at a sumptuous gala dinner with free-flowing bottles fit for the pickiest in the wine trade, all donated by Lifford Wines. On my last day as President of CAPS Ontario, it was an honour and an emotive one, to announce the Best Ontario Sommelier as José-Luis Fernandez of the Hamilton Golf & Country Club. His performance was near flawless and his experience, grace under pressure and general affability won him the title. In a lead up to all of this excitement, CAPS Ontario put together a full day of events beginning with the very first CAPS Wine Tasting Challenge that allowed both amateurs and professionals to test their blind tasting skills. The participants were kept anonymous unless they won prizes which included trips to either Wine Country Ontario or Nova Scotia, restaurant gift certificates, plenty of wine and more. At the same time, the International Wine and Food Fair was taking place showcasing wines from California, Argentina, New Zealand, South Africa, Germany, New York State and VQA Wines of Ontario. WineAlign was also on hand to pour from our latest selection of WineAlign Exchange Case. Each station was paired with an Ontario Wine Educator, armed with information relating their various wine education programs. Post competition, guests were invited to unwind with a luxurious spread featuring oysters, lobster and a multitude of creations by the team at Oliver & Bonacini. Here are six of the memorable selections of the day featured at the CAPS Wine Tasting Challenge. Get your hands on these bottles and you could put together a blind tasting challenge of your very own. Sara d’Amato – A quintessential Finger Lakes Riesling grown on the banks of Seneca Lake, the deepest of the eleven Finger Lakes and the most temperature moderating of them all. Dry and tensely structured yet still offering an affable degree of fruit along with a hint of oiliness and petrol beginning to set in. Sara d’Amato – For a wine to be chosen for a blind tasting competition, it is best if it showcases regional typicity and Rosewood’s Night Moves is a spot-on example of the ample nature and juicy profile of gamay that can be born from Niagara’s terroir. Sara d’Amato – There is a pronounced difference between the malbecs of Mendoza and those of the more northerly region of Salta. El Esteco’s über high altitude plantings result in a wine that has an almost crunchy salinity, a ferrous note and a plenty of floral perfume. The following wines are available at the LCBO. Sara’s VINTAGES picks are restricted to our premium members only for 30 days. You can become a premium member here.